Santhoshe D/o M.K.S.Sukumar is suffering from Craniopharyngioma for the past 17 years. I am running a Tailoring shop at Mayiladuthurai. With meager income from this business and other contributions from my friends and relatives, I was able to spend nearly 25 Lakhs. I have exhausted all my resources and savings. Under the circumstances, once again the problem recurred. 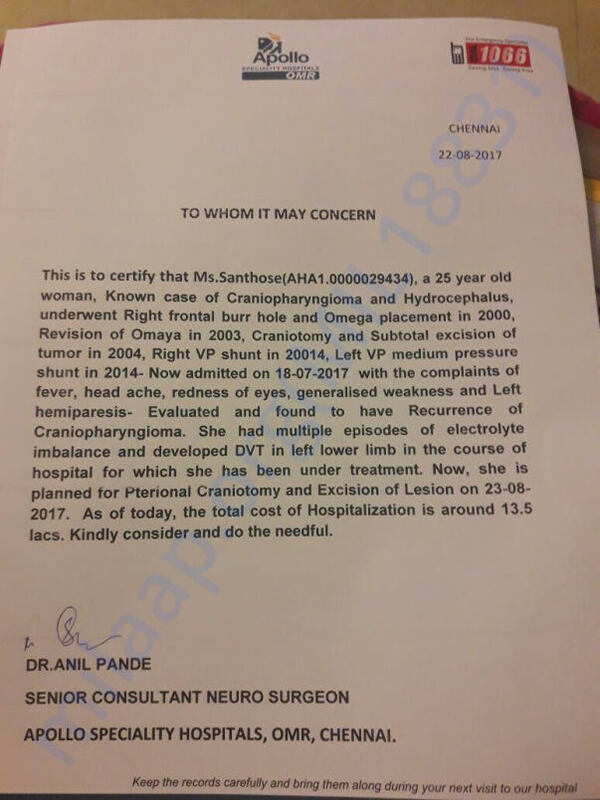 We have enclosed the Neurosurgeon’s letter narrating the entire medical history of Santhoshe. The doctors have advised to carry out the surgery within 15 days. Santhoshe is bravely fighting the condition. 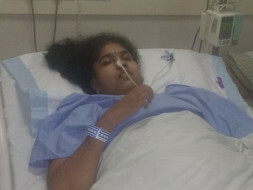 I need your support in carrying out the treatment of my daughter Santhoshe. Kindly contribute now to save her. Santhoshe passed away in the early morning hours of Sunday (October 1st). Our hearts go out to Santhoshe who endured so much pain and fought so hard for her life. She had been discharged from the hospital on Thursday- 27th September and was at her house in Mayiladuthurai. She seemed to be responding well. On Sunday- she developed some breathing problems, and unfortunately could not be revived. Your timely support ensured that she received the best medical care. Funds raised have been utilized for the medical expenses. The family is grateful for all the care and support you’ve shown Santhoshe. The past few days have been the most difficult ones for the family. May they find strength in this time of grief. May Santhoshe’s soul find peace. Please keep the family in your prayers. We are happy to inform that Santhoshe will be discharged from Hospital on 27th Sep 2017 and has to visit in the first week of Oct 2017 for review. Thank you all for the support so far. We will keep you posted on the progress. Thank you all so much for your support during this time. We have some good news to share. Santhoshe is recovering well post her surgery. She has been moved back to the general ward. Her recovery is on track, and doctors are saying she is likely to be be discharged this week.